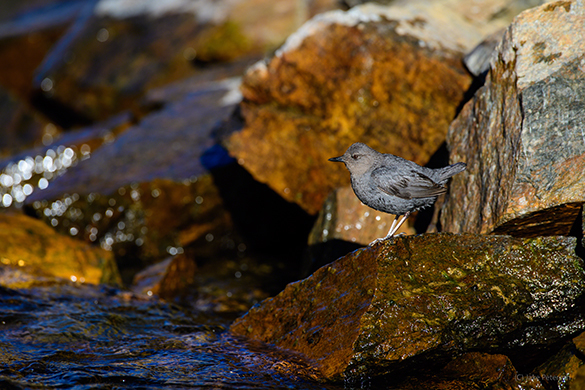 The American Dipper is an amazing species that demonstrates the evolution of survival. This bird which is no bigger then a softball lives along streams and rivers and eats mainly aquatic insects. It’s dives underwater to catch it’s prey and actually has a special membrane over it’s eyes that allows it to see underwater. It’s just a really cool little bird. 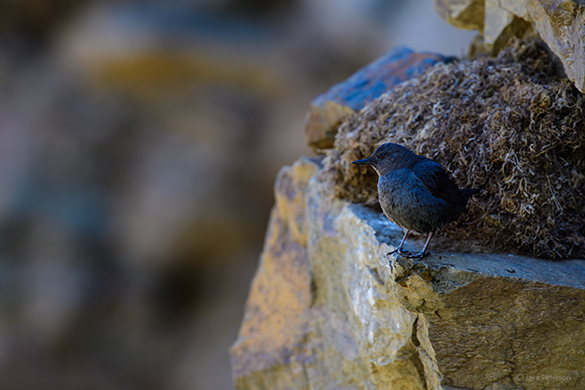 Now Dippers tend to nest in mossy outcrops next to a pool of water attached to the stream. They can also nest on cliffs and rocks but those tend to be a little harder to find. This one I lucked out in finding because it was ten feet up above the Madison River. Not only that but the way the sun moved around the cliff made for some very interesting lighting which I’ll talk about tomorrow. The whole time I was shooting with the D5 and 600f4. I spent a while watching the birds making sure they were comfortable with me being as close as I was so that they would continue to do their thing. I didn’t want them away from the nest for too long. One of the great aspects of Dippers is they tend to bounce around a lot. This often provides multiple backgrounds to work with. Downside is they are dark/black in color so you really have to get the nice light and right background to see that depth in their feathers. Really great birds to work with if you ever get the chance.